This tile backsplash post is a bit overdue. I’ve been meaning to get it done for awhile now. I haven’t most likely because I wasn’t blogging when I did this project so don’t have much in the way of “tutorial” type photos. 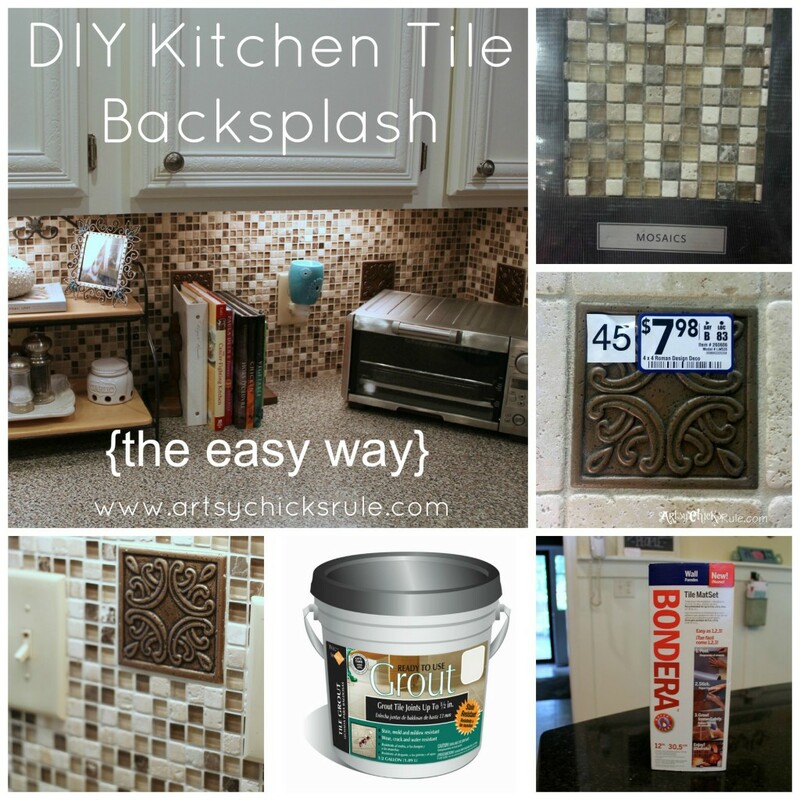 I will do my best to try to walk you through the tile backsplash installation a bit instead. I will say it was easy, easy, easy. I started this project on a Sunday evening and finished the following evening by 6pm. I know, I remember vividly. It was my Dad’s birthday the following day and we had to be out of the house by 6 to go to dinner. I was determined to finish before I left. And I did. There are two sides to the back splash. And yes, those are indeed my Chalk Painted cabinets…and the laminate counter top we put in 9 years ago that we are replacing with wood. I think. That is the plan anyway…but it is ever evolving around here. I just know I’m more than ready to get my farmhouse sink IN! So let’s start with the actual tile I used. I got it at Lowe’s and it used to come packaged like this…. But it seems to be packaged like this now…. (without the box). Either way, it’s the same product. Product info in the photo. And as you can see from the first picture, I chose to add bronze colored medallions…also from Lowe’s. 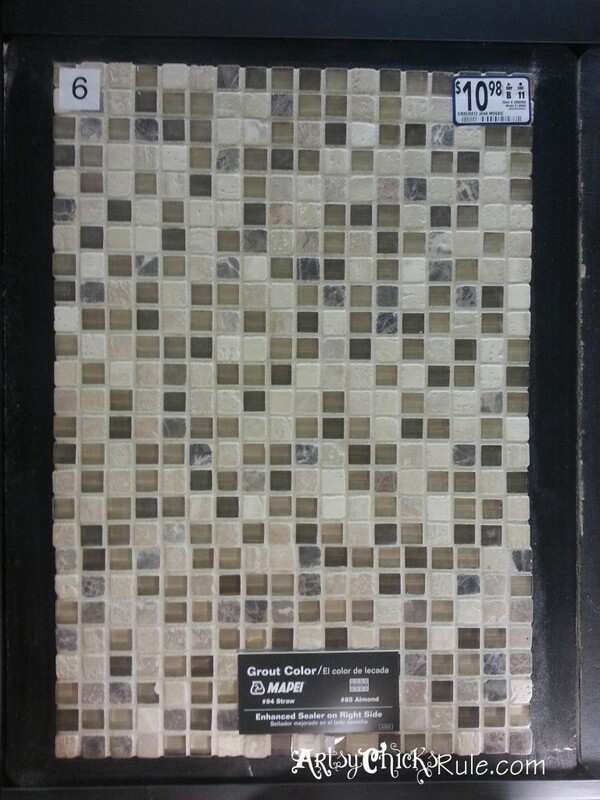 Here is a sample of the finished tile with grout at Lowe’s. I have no clue what color, but it was pale. Probably beige, sand or almond in shade. It really made the job easy (I remember that!) because it was ready to use. Now as I’ve already warned you, I don’t have photos of the actual process but I’m telling you….it was simple, really. I mean, don’t get me wrong, it was work, it was just very do-able work! And this is the magic. Well, it’s not really magic but it IS sticky. Like super, crazy, ridiculously sticky. See? I couldn’t even pull it out of the box because it was stuck! But it’s been there for 2 years like that so it didn’t want to budge. Apply to wall…that’s the gist anyway. We’ve used regular mortar and grout to tile a bathroom floor and honestly I did not want to mess with all that again. So the helpful guy at my local Lowe’s showed me this product and I thought I’d give it a try. And the tile I chose was really easy to work with too since it came in sheets with no large tiles to cut to fit. I cut and measured every single piece the night before. (of the Bondera and the tile sheets) Then I laid them out along the entire counter where they went. The next morning I started applying. You know that thin little film that is usually attached to the backs of the tiles? Look, you can see the edge of it on the corner of the large piece of tile below….see it to the left there? 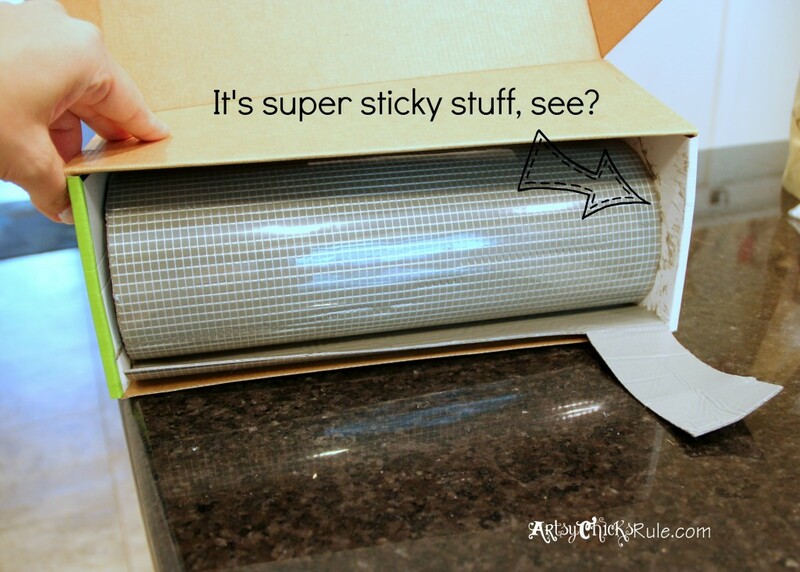 Well, don’t put your Bondera on the wall, then remove the plastic film so the sticky is exposed….and then position your tile sheet over it WITHOUT removing the thin film from the back of the tile sheet. Do not do that!! You know why? Because then you have a really pretty wall of white film instead of tile. Ask me how I know. Oops. And because it is pretty much impossible to remove the Bondera to start again…. I probably wasted over an hour fixing that little snafu alone. Anyway, you can see in that picture above the squares I cut out for the medallions to fit. Pretty easy because it’s all squares! In my kitchen I did not have an area at the top of the tile that needed to be finished off pretty. All was hidden under cabinets. 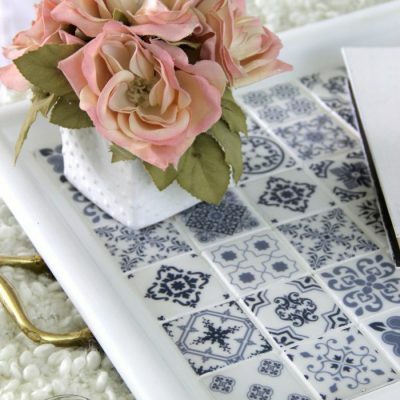 But if you do, you can use the long, thin tile strips, or even wood, for a finished look. Here is a picture of how I worked around the trim of the window….. Yes, I know there is a bit of a gap at the corner with a bunch of grout. But trust me, no one notices. As it goes up the wall it evens out since that bottom trim is angled…..as you can see in this photo. 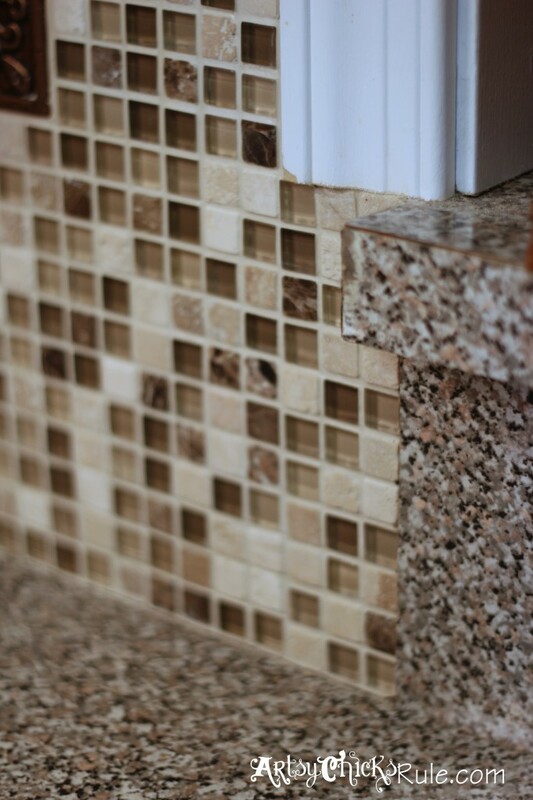 This is the top edge of the tile…..just under the cabinet. There is a slight space because we have under cabinet lighting. The top edge of the tile cannot really be seen. A close up of the medallion and tile…..
Another….and you can see where I had a little “oopsie” right above the right side of the medallion. Remember, the Bondera is super sticky stuff so be sure of where you are putting your tiles because they won’t really want to move after. I’m not worried about it because it’s not really noticeable, mainly because of the style of this particular tile. And this is the edge where the tile ends and the bar top begins. After lots of wiping and cleaning the sponge out and wiping some more, you are done! 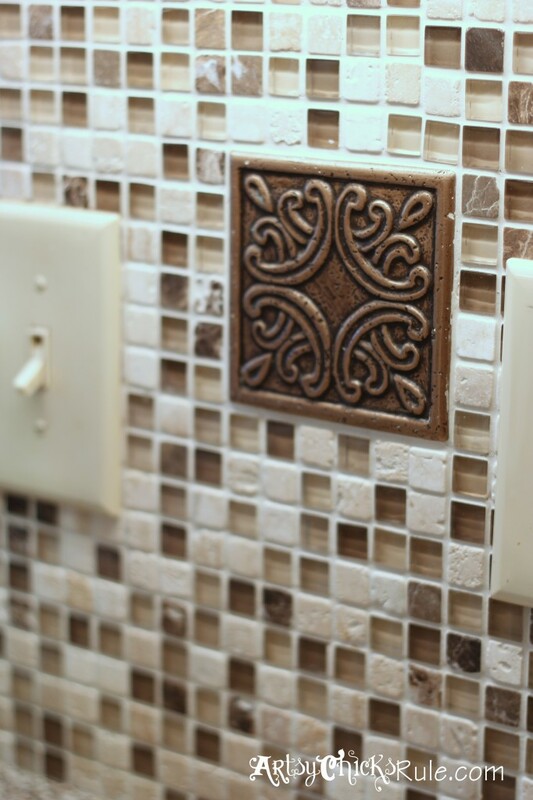 PIN this tile backsplash for later!! 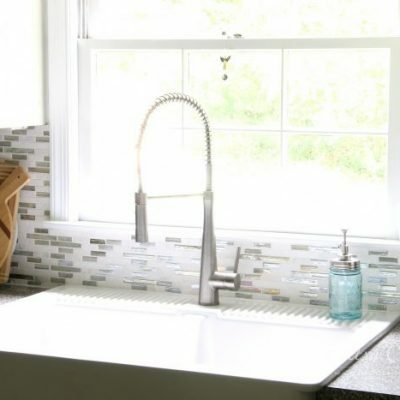 Change the look of your kitchen (or bath) in less than a day (or two) with a new tile backsplash. What do you think? Is this is a project you would try to tackle? I think anyone can! EDITED to add, I’ve since re-tiled this space. 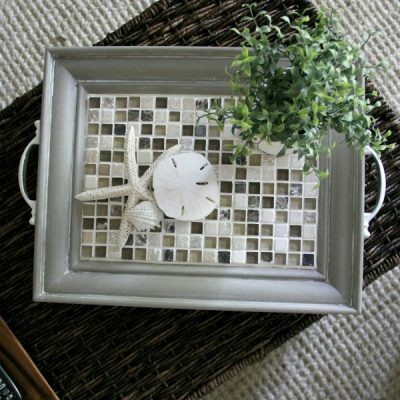 See it and all the details, here, “Coastal Inspired Tile Backsplash“. 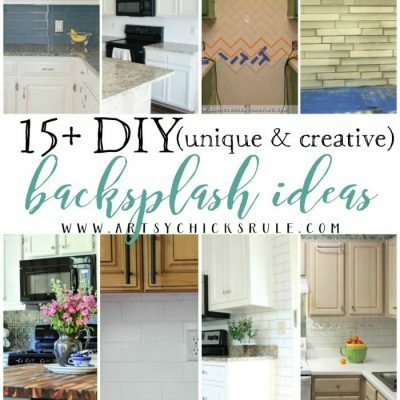 I loved tiled backsplashes…I eventually want to tile the splash in the new kitchen, but I know I’ll have to wait awhile and make SURE it’s what I want because it’s such a commitment! I know me, and I’d no more than get something put up and I’ll wish I’d done something different. And I know my husband would choke me to death if I ever suggested changing it down the road. Choke. To. Death. Thank you, Nancy, for posting this! It really does look gorgeous and you did a fantastic job! 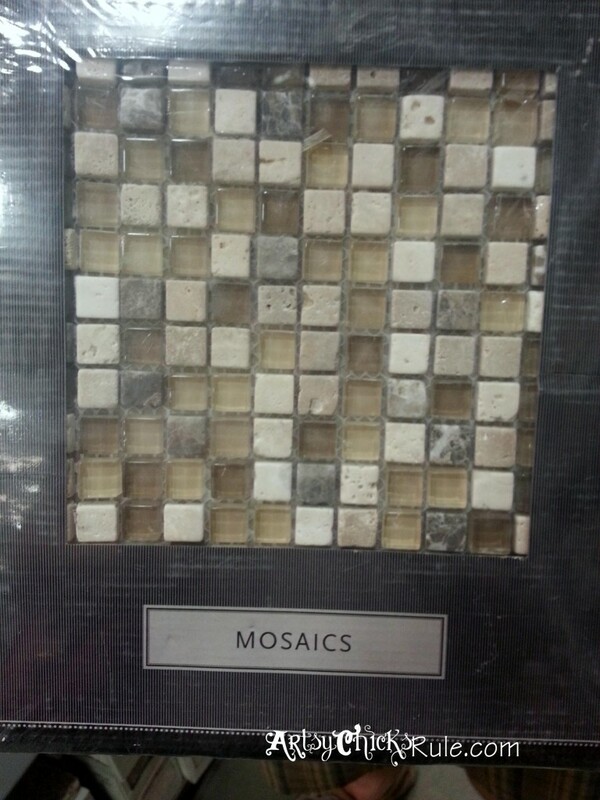 I can’t wait to tile my back splash and I may use this very same tile…. I’m still stuck between using this and white subway tile. Can I use the Bondera on that as well? Hey Karen! I hope it helps with your project. I sure wish I had taken pictures during to share here. I think either tile will look great. The white subway tiles are so nice and clean looking. I do love the multi of this one though. I would imagine the Bondera would work well with those as well. I would double check with the guys at Lowe’s though. I’ve only done this tile job with it so far although I do have some ideas stirring around in my head. ;) I’d love to see it when it’s done whichever tile you choose! I work at Home Depot as a Flooring Specialist, which includes tile floors, backsplash, bath, etc. I am assuming Bondera is similar to SimpleMat at THD. You can use it to install most any tile, as long as it is NOT in a wet area (shower, outdoors, pool, etc.). It is also NOT made for floors! It is great for tile surround mirrors too! 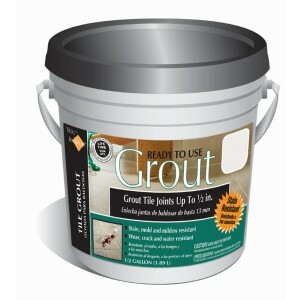 Many DIYers love it because you can grout it the same day! 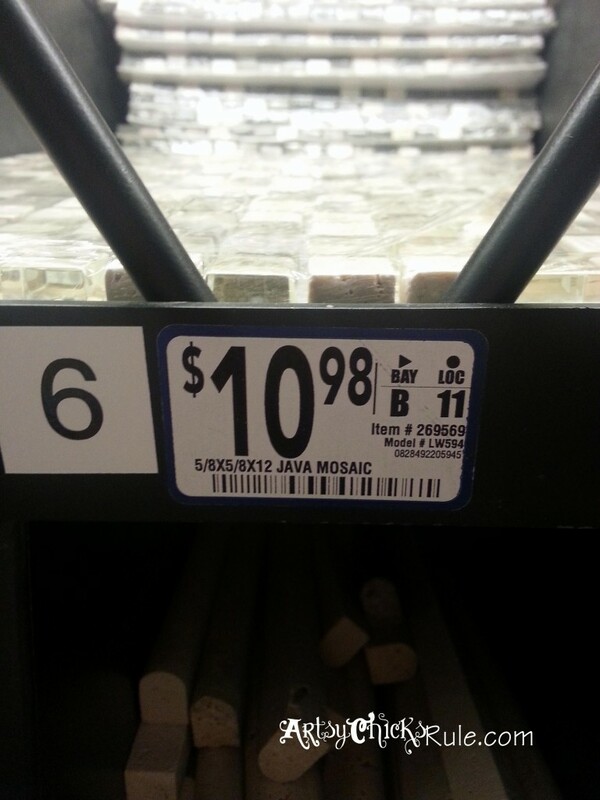 When I teach a tiling class, it usually sells itself! Nancy, your backsplash looks amazing! Yes, I think it is similar to that. THD used to carry Bondera (them or Lowe’s, or both, I don’t remember which I purchased it at now). Can you put this Bondera over a coat of paint on the wall? Or will it pull the paint off? I painted over vinyl covered sheetrock (using primer). I’m just wondering if this will pull the paint off and fall off. Thanks so much. Looks amazing & what oops?! If someone is looking that closely they have issues. We’re thinking the faux stone and I will certainly remember (write down) to check out the Bondera. Nancy, this is so beautiful and extremely timely…I am giving thought to removing wall paper and putting up tile or something. I have looked at Weathered Stone, which is actually like a paper that you cut to size (large tile size…small tile size, squares, rectangles, whatever,) then, stick up and grout. Not sure which way I will go, but you sure gave me some food for thought. I am impressed with your outcome. 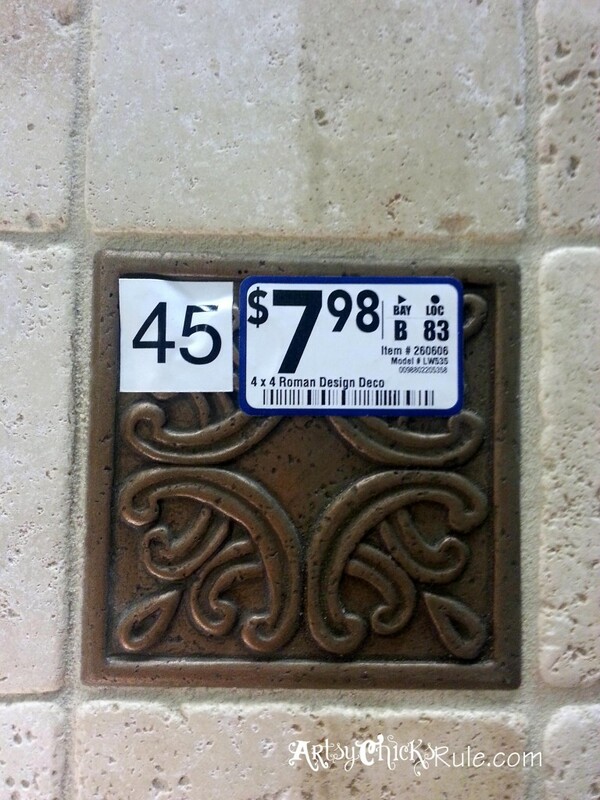 Tell me, tho….was that medallion tile $7.97 EACH? Yikes! Hi! Great job – you should be so proud of yourself! 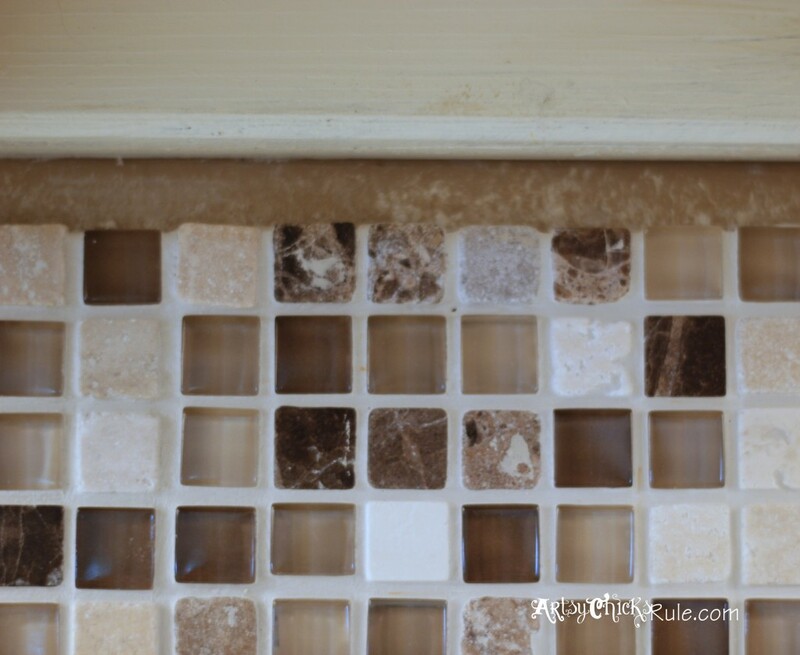 I stay away from complicated tile stuff myself- I did my backsplash in faux tile – using a few textures and taping out the grout lines and troweling on the texture. Came out great – toughest part was the taping! 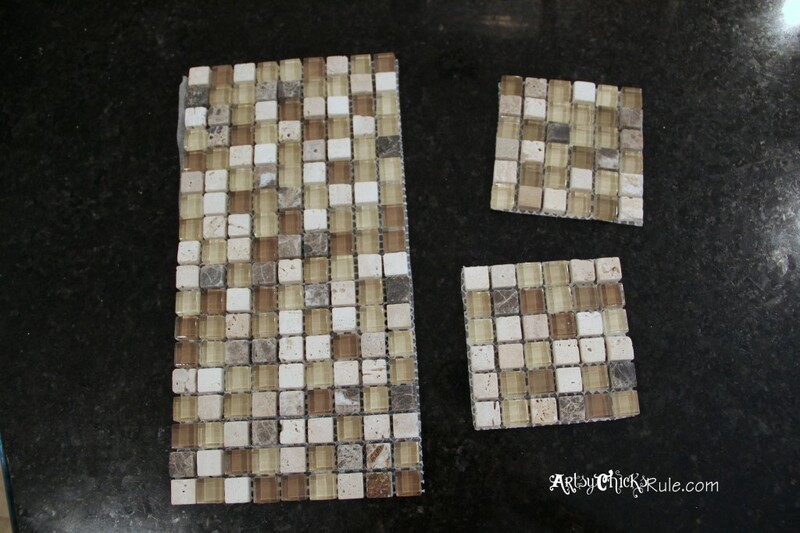 Wonderful tips Dria, and I bet this would work really well for mosaics on tabletops! 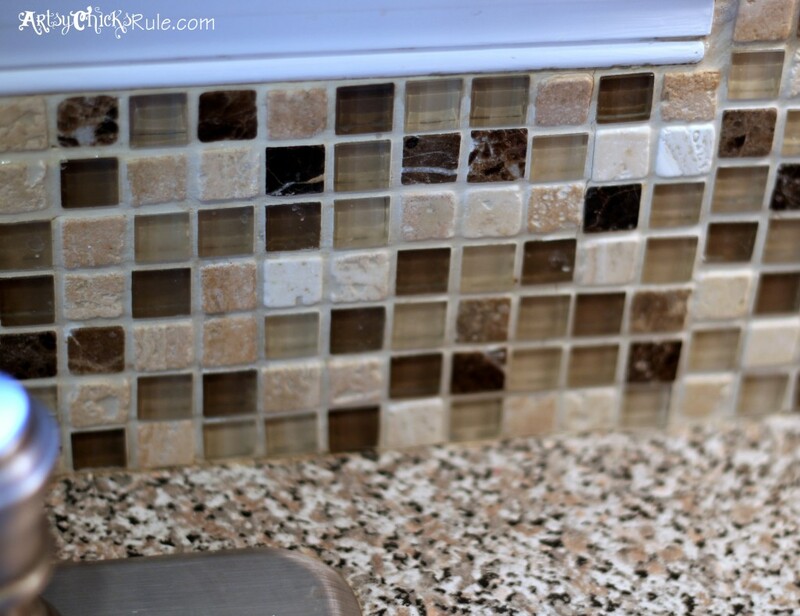 Beautiful finished backsplash! Item been trying to decide what to do with my plain white walls. Thank you for the easy steps to follow. Nancy, your backsplash looks so beautifu! I so want to tackle this in my kitchen but I’ve been dragging my feet because I’m worried about pulling out the little 3-in piece of granite that’s there now. I seriously probably just going for it on a weekly basis but at this point I think I’ll wait until for my 3 girls go Ja k to school at the end of Aug.
Looks great! And sounds easy, but I have one question: Are you saying that one should remove the mesh backing from the tile? I love the idea of using something like Bondera instead of thinset, but if it means placing tiles one by one, it doesn’t seem worth it. So, I guess I’m a little unclear about the process at that point. Any clarification is much appreciated! Thanks so much! I’m gonna tackle my backsplash soon. Just trying to get geared up for it. Oops You Have Already Answered My Question, Lol. So ThankYou. I Hope Mine Looks As Goods As Yours! Great job, Nancy! I really love the medallions. Aw thanks! 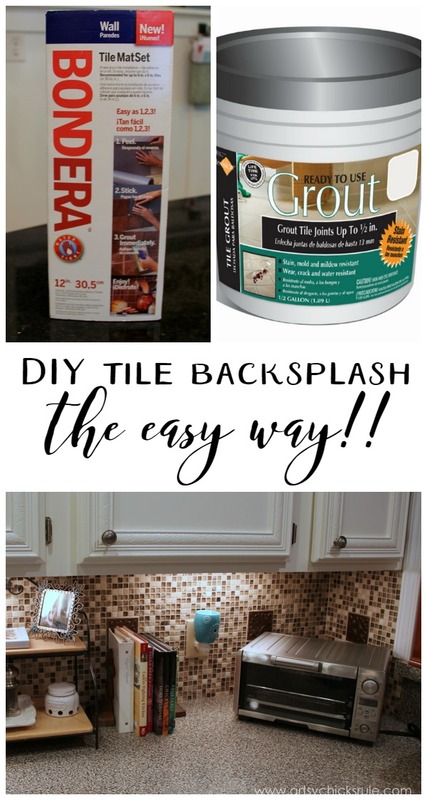 :) It was super easy to use and I think you should give it a try if you have a tile job you need to do! Great job! We used Bondera for our shower and absolutely loved it! Now we’re thinking about using tile for our kitchen countertop. Goodbye laminate! Hi Marty! I had read you can use it in showers too…that’s good to know!! We still have a master bath that needs a complete renovation!! (it keeps getting pushed to the bottom of the list!) And we are doing a fully tiled shower (replacement). Glad to hear it went well in that application too! It’s so pretty, Nancy! 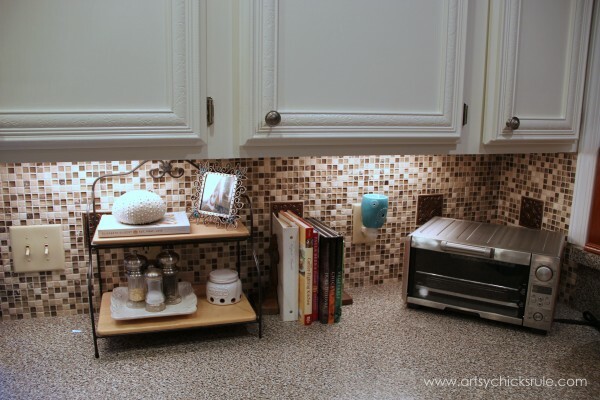 I would LOVE to do this to ours, but our current (ugly) backsplash has such thick grout that I’m afraid of the removal process. :-/ After seeing how gorgeous yours is, though, I may just have to attempt it. Hope you’re having a great week! Love this look! The meathead who re-did the kitchen before I bought my house used the matching laminate on the counters and the backsplash. It is very easy to keep clean but UGLY! (Faux granite looks like faux!) I had just been reading about the Bondera product. I know how to lay tile but was not excited about the prospect of tiling over the laminate. Looks like the Bondera will stick to both the wall and tile making the job much easier. it looks wonderful Nancy! 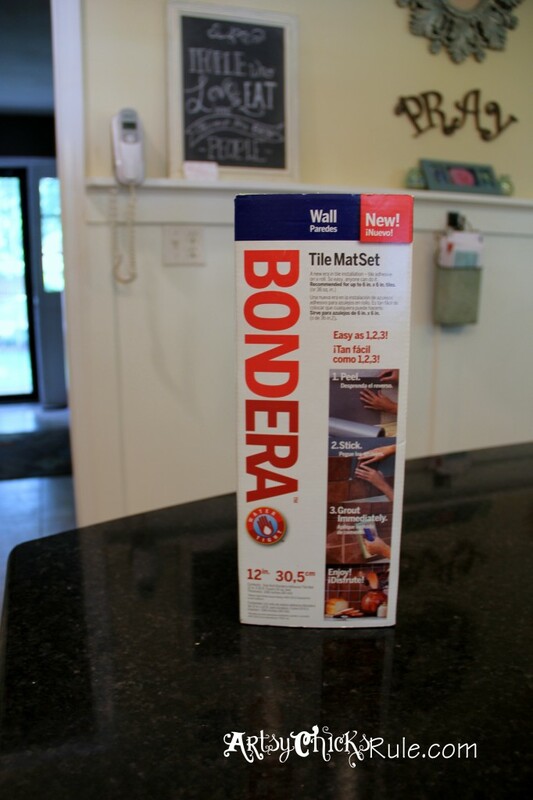 I have been tiling for years but not for the past 8 at least…so I have never heard of Bondera! What a helpful product! I think it should really take the “scare” out of tiling for sure! Love the new backsplash! I love the backsplash what a great job! I love your blog and love following you in Instagram too just wanted you to know I have added you on the sidebar of my blog so I can get here every day lol! Great tile job you did there, Nancy! I love the tiles you chose. Bondera works great for almost any tiling project. 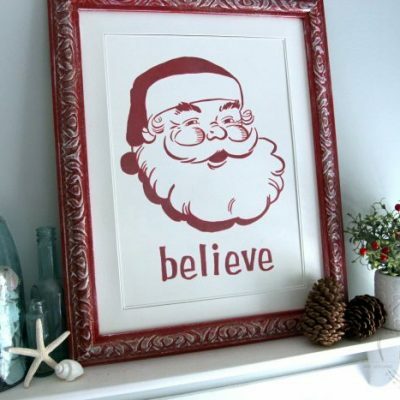 It repels water, it’s mold resistant and it’s eco-friendly. Anyone can use Bondera because it is very easy to use. 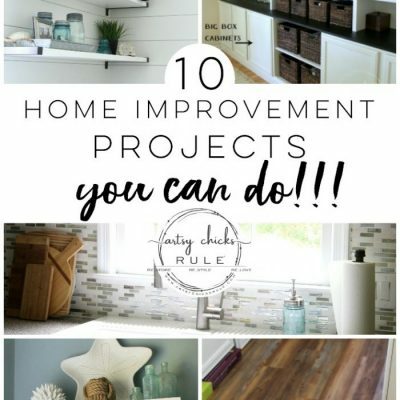 As long as it’s used on kitchen walls, backsplashes and countertops; bathroom walls and countertops; tub and shower surrounds; and other horizontal or vertical interior spaces it will work great. Also, Bondera can be applied to any clean, flat, smooth and stable surface including drywall, plywood (horizontal applications only), cement board, existing tile, metal, laminate, Corian and Formica. Here is the company’s website http://www.bonderatilematset.com/index.html and their Facebook Page https://www.facebook.com/BonderaTileMatSet. Beautiful! So you put the Bondera on the wall and leave the film on the back of the tiles? Attach the non-sticky back of the tiles to the stick Bondera? Thank you for posting this! Question for you: How is the Bondera Holding up? Still sticking to the walls? Just curious as to how it help up after installation? Also, any issues in the wet area around the sink? It seems a great idea, was just wondering how it held up so far? It has held up fantastically actually. I have had no problems with it anywhere (sink or otherwise). It has been over 2 years since installation. I am pretty sure this product can be used in shower stalls (or they have a different Bondera product for that but I’m fairly certain I’ve seen it) as well so water should not be problem for it. Great job. I am wanting to tackle my backsplash also and actually picked out some sheets at home depot I liked. Using that product sounds so easy. My question is did you have to cut around outlets. If so, how? Also did your outlets go back on easily or did you have to use an extender? Thanks..this product was super easy to use. :) As far as the outlets go, I just cut enough tile out so that the outlet (inside part) was open and the cover plate still covered the tile. I did not have to use an extender of any sort, I just adjusted the outlet out a bit to accommodate the space. The Bondera is not thick and the tiles were not very thick either so there really wasn’t that much of an adjustment. Help!! lol You didn’t have to cut any of the tiles? How did you get it all to fit so perfectly. I’m a little burnt out, french fried and tired. I’ll keep reading. I’m perplexed about the wall outlets and any area around window sills. You didn’t have to cut one tile LOL. Oh boy. I didn’t really have to cut any. It looks as if I did nip the corner off of the 2 tiny pieces on either side of the window sill(I did this project 2 and 1/2 years ago now and wasn’t blogging then). But for the rest of that area I just filled it in with the grout instead of trying to cut those tiny pieces. (probably not the best idea but it wasn’t a large space as seen in a picture above). The rest of the area was square so no need to cut any tiles. Larger tiles would have been a bit tougher I think. Nancy, this is awesome! So glad to read your tips. Thank you! OH that’s great!! And I totally agree!! 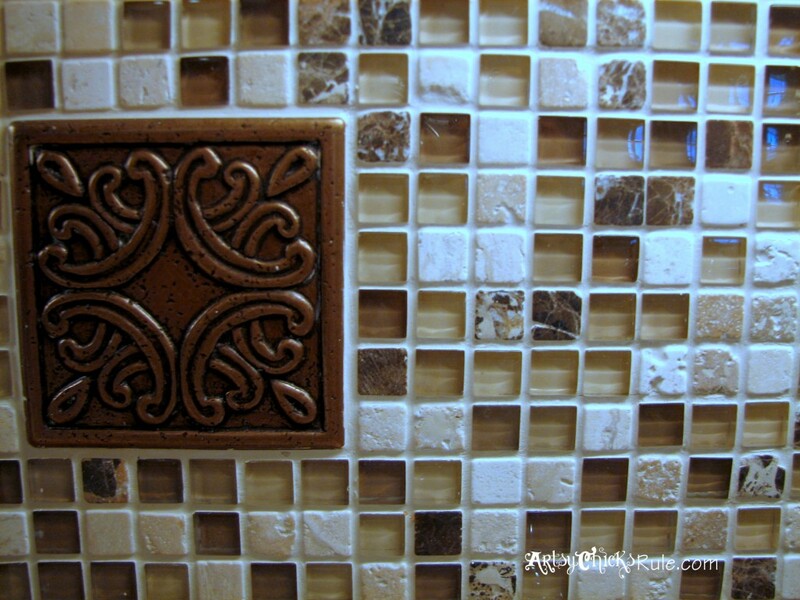 We have another tile job to do in our master bath and I may do it this same way! And I so wish I had been blogging then …or had taken pictures during the process! A picture is always worth a thousand words!! 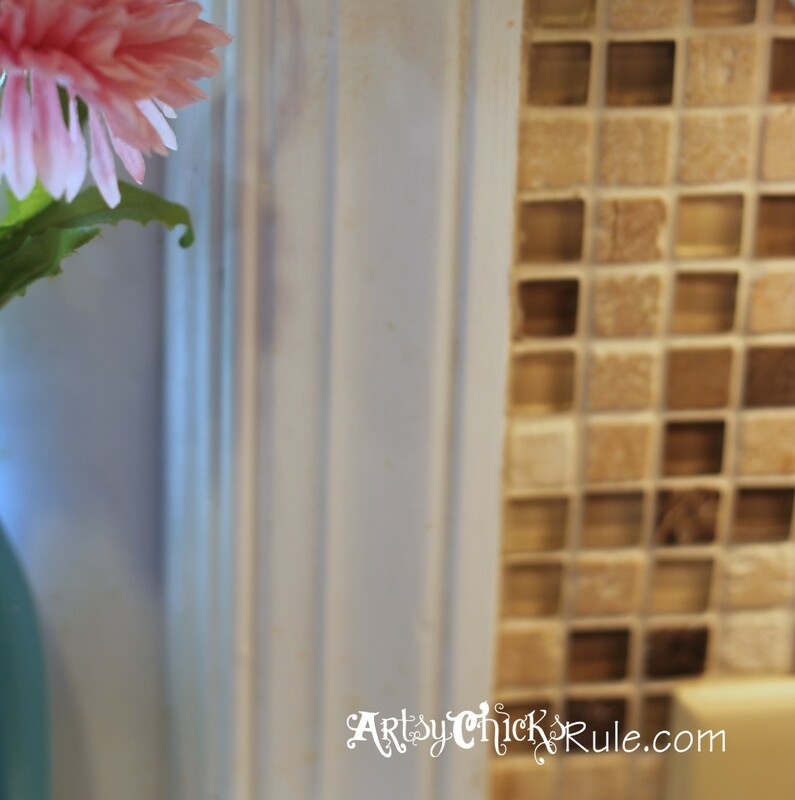 :) I may do this again in our Master Bath renovation and will most definitely take pictures of the entire process then! Oh Nancy, you have no idea what Pinterest and all the great bloggers like yourself who support us women, with your ‘go for it’ attitude. Not to mention the money saved. lol Thank you for sharing so freely. I <3 ya's all. I'm a bit over the hill, 64 and did a lot of DIY stuff but, without the internet, blogs, etc. Wow, it's opened up a whole new world for me. I'm still in the race LOL!!! Yes, we’ve done it all here in the last 10 years of living in this house. I am not sure I could pay someone to do it now!! I’m jaded. ;) Too much money saved to give someone my money to do what I know we can do ourselves. My spousal unit is used to this now. This is my last house, not a fixer but, you know we ‘doing types’ have to put our mark on any place we move into. This is my 7th house in 3 different states. The longest fixer was a 16 year commitment. When I got it jusssst right. My husbands company went belly up and we’ve moved from NJ to NC. Oh well, new projects such as the tile and Bondera. You have a great week, too. And all you Artsy Chicks, you DO rule. How beautiful! I love that Bonera product. I agree :). I showed these pictures to my husband to prove it CAN look good without it! 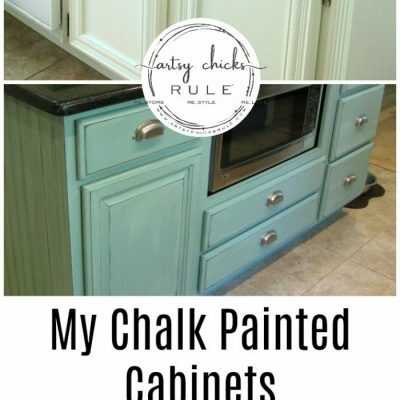 Once I’m finished remodeling the kitchen, (I’m also using chalk paint on my cabinets as well), I’ll do a post on the whole transformation. I just set up my blog this week! That’s so great. :) And thank you!!! I am getting ready to paint my laundry cabinets again for the 4th time! I think.